The age of digital images has changed the way we preserve our memories. A single photo can say more about an experience you are having than a thousand words and with so many social networks sharing an experience has never been easier. We are all just a few clicks away from being praised or criticized for our actions and our friends are never too far away. We are all accustomed to a certain image quality, that makes the content we share look even more beautiful. That is why having an iPhone camera lens kit can take you a step closer to the amazing picture quality that will make sure your memories are captured with the best equipment available. An iPhone or a DSLR camera regardless of how many megapixels they have cannot achieve their maximum potential without a proper lens. Since 2007 iPhoneography has attracted a lot of attention from the professional photographers, but the fact remains that even the most skilled photographers need to use a lens to take a photo. There are several different kinds of lenses you can use on your iPhone. Wide angle lenses are best suited for landscapes or cityscapes because they expand your camera's field of vision, thus allowing you to capture more space in a photo. Fisheye and SuperFisheye lenses are best described as wide angle lenses on steroids. They can cover angles of 180 and 235 degrees, but they distort an image into a hemisphere. Telelenses and macro lenses are all about taking pictures of things that are far away from you or that are so tiny that you can't capture them with a wide angle lens. Most telelenses for iPhones can bring you two times closer to your subject. Using a macro lens will allow you to take close-up shots of things that can hardly be seen with the naked eye. Polarizers create a filter over the photo and change the wavelength of the light captured by the camera. Using polarizers results in highly saturated photos. So let's take a look at some of the best camera lens brands for iPhone photography. The great thing about Photojojo lenses is that they are compatible with iPhones, iPods, iPads, Android phones, and tablets with or without a case. If you have the iPhone 7 then the right choice for you are the iris lenses labeled by the company as 'your secret weapon against boring photos', however, they are not compatible with any other device other than iPhone's latest models. 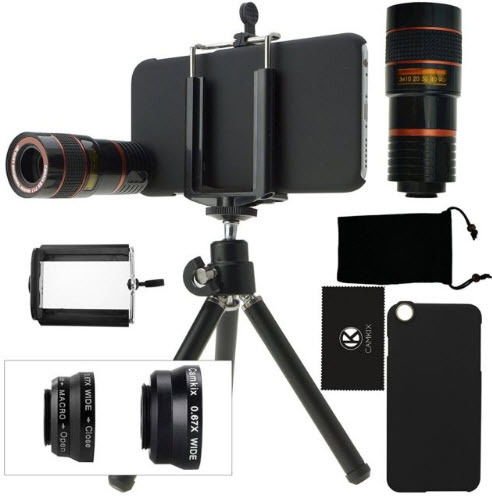 The lens kit includes four lenses that cover the needs of most iPhone photographers. Photojojo's lens kits can be ordered on Amazon for approximately 50$ per kit, which makes these lenses practically a steal when you take into consideration the quality of the photos they are capable of producing. Using one of these lenses on your iPhone or any other device feels like you are holding a DSLR camera in your pocket, and most people who see your pictures will not be able to tell the difference. If you aspire to give your photos a more professional look, then Moment lenses are the right choice for you. The company claims that their wide, tele and macro lenses 'are the only mobile lenses in the world that don’t distort your picture.' Moment lenses can be utilized equally effectively for video and photography purposes. Each of lens models is phone independent which allows users to use the same lenses with different devices. All lens models for iPhones, Android phones, and other gadgets can be purchased directly on the company's website. The prices of lenses start at $100 which makes Moment lenses a rather expensive option. Their lenses are sturdy but bulky, which adds to the overall weight of the device you are using to take pictures. Moment lenses for iPhones will surely aid you in making your photographic statements, but it is worth noting that these lenses are best suited for more experienced photographers. 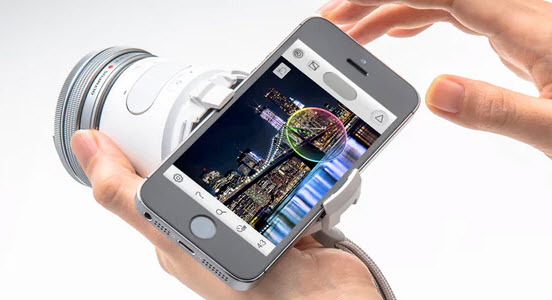 Zeiss ExoLens is an interchangeable lens system for iPhone6 and above. Zeiss lenses are probably the lenses professional photographers love the most, and there is very little reason to assume that Zeiss ExoLens for iPhones offers anything less than superb quality to its users. All lens models are made of aluminum, which makes them very light and almost completely resistant to damages caused by bumping of falling. The clip-on Zeiss ExoLens kits cover the full range of focal length from wide angle to telephoto lens, with state of the art glass that makes sure your images have the best quality. Telelenses create a visible distinction between the foreground and the background which is why the photos taken with this lens resemble the images captured with a professional DSLR camera. The standard lens Zeiss ExoLens kit for iPhone7 costs between $250 and $200, which is why it is mostly reserved for users that want to create photographs of the highest standard. Currently, there are no plans to develop a case for the latest iPhone models. 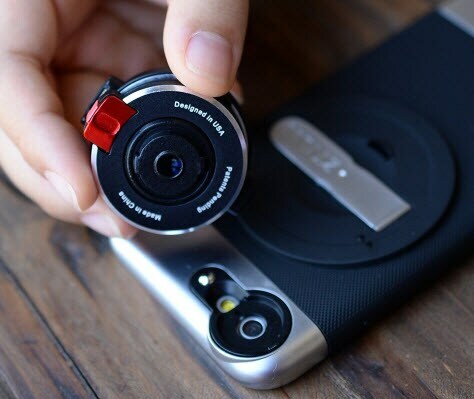 The iPro lens system comes with a case that enables the user to mount the lens onto the phone. Whether you choose to use a telelens of a fisheye the results you will get will be absolutely amazing. The price of wide angle or a fisheye lens is between $75 and $65, while you can buy a new iPro macro lens for less than $40. CamKix's lens kits are a pocket-sized photography powerhouse. Most of the industry experts praise them for their simplicity and more than affordable price. None of the lenses from the kit require a special case or mount that is attached to the phone. With a clip based system that is easy to use, these lenses require the minimum effort to mount and dismount. 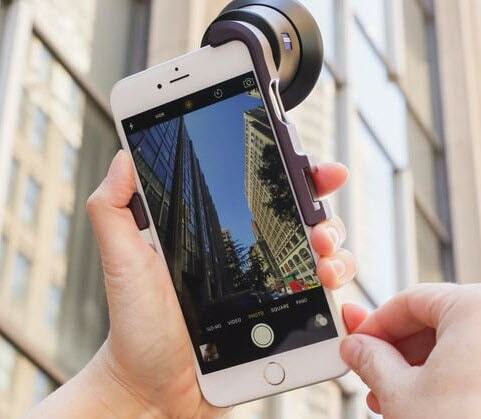 CamKix's Camera Lens Kit for iPhone 6 Plus and 6S Plus include an 8x Telephoto Lens, a Fisheye Lens and 2 in 1 Macro and Wide Angle Lens. Lenses for other Apple's devices and different versions of the iPhone are also available. It is worth noting that the company hasn't released a kit for iPhone 7 or any of the iPhone's recent models. All of the CamKix's kits are designed to cover everything from ultra wide lenses that have an 180-degree view to telelenses that allow you to zoom in on your subject while avoiding the dreadful blurry pixelated photos. 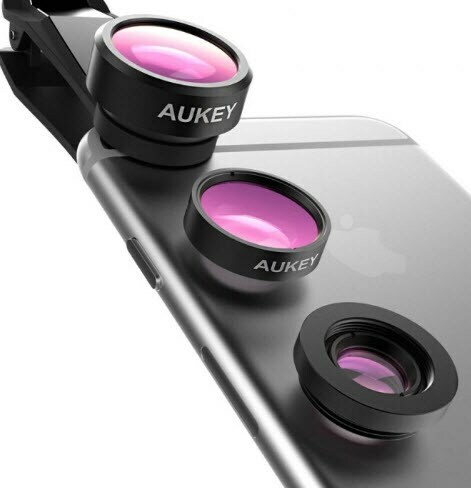 A mobile tech manufacturer and one of the top sellers on Amazon, Aukey's lenses for iPhones are among the best on the market. They became known for their 2 in 1 lenses that merge the properties of a fisheye and a macro lens. Most of the lenses are mounted on the iPhone by a simple clip based mount technology that has been recently criticized by some photographers because it can obscure the view of wide angle lens. Auckey's lens models like PL-A1 combine the properties of wide-angle, macro and fisheye lenses which allow the users to capture different scenes with the same amount of efficiency. In addition to their 3 in 1 and 2 in 1 sets, the company offers a large number of different lenses and lens filters. All of their lenses are made out of aluminum, which is the reason they very light and practical to carry around. Sony's products for digital photography have been among the very best and can only be compared with cameras and lenses produced by Canon or Nikon. 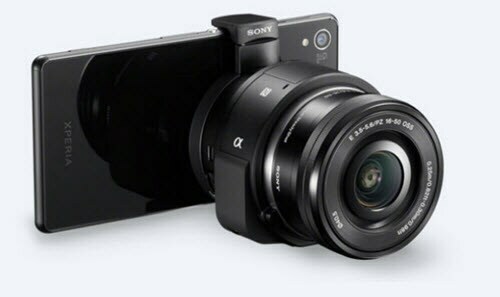 Therefore, it comes as no surprise that Sony has released a DSC-QX30 compact camera that can also be used as a Smartphone lens. It is a remarkable piece of equipment that is compatible with almost all of the iPhone's models. DSC-QX30 features a 20.1 MP sensor, it can record video in full HD and it is controlled via the PlayMemories app that can be installed on your iPhone or your tablet. 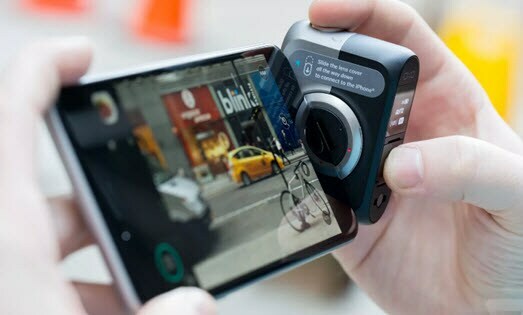 An iPhone can be clipped on the back of DSC-QX30, but this is a camera in its own right and can be used independently from an iPhone or a tablet. The price of this amazing compact camera is $330, which makes it a rather luxurious piece of equipment. This is a lightweight pocket-sized photo camera that can be operated remotely from an iPhone or any other Smartphone. 1-inch sensor and 20.2 megapixels allow DxO One to capture the finest details in your portraits or cityscapes. The camera is capable of producing both RAW and JPEG picture formats. DxO One can be easily connected with an iPhone and once devices are connected the iPhone's screen turns into the camera's viewfinder. You can adjust ISO values, aperture or switch between photo and video modes almost effortlessly. DxO One is a kind of camera you can carry with you anywhere you go and not worry about the bulky camera bags or the weight. DxO One is priced at 600$ but the stunning image quality it produces justifies the high price. The camera's biggest drawback is relatively short battery life. Any camera produced by Olympus doesn't need a special introduction because the company's name is synonymous with quality and great performance. Olympus AIR A01 is an open platform camera that follows the footsteps of Sony's QX100 and QX10. This an exciting concept that combines the best qualities of the professional DSLR cameras and the intelligence of Apple's iPhones. It can be easily mounted on an iPhone and operated from the phone's display. The Olympus AIR A01 is equipped with 16 Megapixel Live MOS sensor, Micro Four Thirds Lens Camera, 1/16000s Electronic Silent Shutter that all contribute to the stunning abilities of this light and easy to use the camera. The users can choose between a number of photo and video modes and the camera can capture both RAW and JPEG files. Once it is synced with a mobile device the footage created by the camera can easily be uploaded on the Internet. At one point a 360-degree video popped out in the news feed of one your social network accounts. The chances are that the video you watched was filmed with Insta360 Nano, a tiny camera that can be attached to iPhone 6 or iPhone 7 and iPhone 7 Plus. The camera turns the display of an iPhone into its viewfinder, but it also can be used without a smartphone provided you don't need a preview of the scene you are filming. The camera's specs are awe-inspiring because it combines two 210-degrees fisheye lenses, it can capture 3K footage at 30fps and it has its own Micro SD slot. 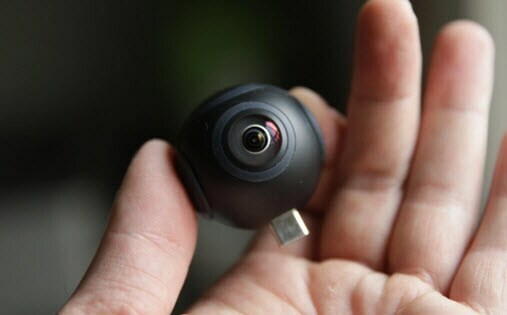 Insta360 Nano is connected to an iPhone via the lightning connector that physically attaches the camera to the device. Despite its amazing potential the most popular 360-degree camera for iPhones still has more than a few downsides. Perhaps the biggest drawback is that the camera hasn't performed well in low light conditions. Changing a lens isn't always as easy as it sounds and it is often difficult to change it while you are outdoors. Ztylus's 4 in 1 revolving lens kit changes all that because it allows you to switch between lenses at will. The kit comes paired with a sturdy metal phone case that allows you to take more extreme shots and you don't have to worry about what happens if you accidentally drop your phone. Mounting the case and lenses on your phone might be a bit tricky, but once they are in place switching between lenses is easy. The users can choose between polarizing, macro, wide and fisheye lenses. The images produced with these optics are a considerable improvement from the iPhone 6's built-in camera. 4 in 1 revolving lens kit for iPhone 6 is priced at just $59.99 which is more than a competitive price for a kit that is capable of such great performances.